And just like that, Black Friday has come and gone, and the initial results have retailers feeling something approximating optimism. The National Retail Federation reported that this year's Black Friday online spending totaled $3.34B USD, up 21.6 percent from $2.74B in 2015. However, the amount spent per person over the weekend decreased to $289.19 from $299.60 in 2015. The good news is that discounting trends have remained mostly stable in the United States from last year’s Black Friday, which is remarkable considering the events of 2016. In fact, our research across the Fast Fashion, Value, Mid-Tier, and Luxury department store sectors show the quantities of these retailers' assortments on discount has decreased 0.6% from 2015. There were differences to note, however, by sector. Luxury saw markedly higher numbers of items marked down, while Fast Fashion and Value sectors saw fewer items being marked down. What we did see was a very slight increase in the percentage-off stores were offering, up 0.5% from last year. 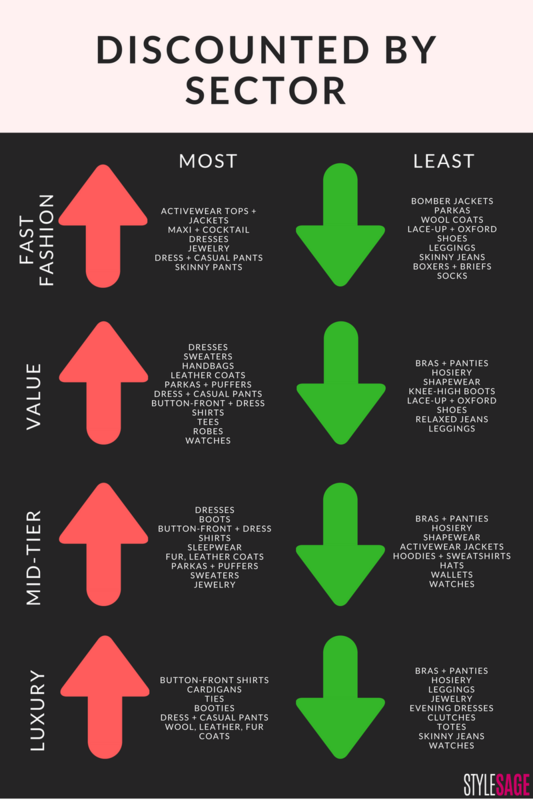 Here the differences were modest, with Fast Fashion, Mid-Tier, and Luxury seeing slightly higher discount levels and slightly lower discount levels in the Value store sector. What we saw marked down in recent weeks remained consistent during the Black Friday weekend. The categories most resilient to discounting were basics like leggings, lingerie, shapewear, and hosiery, while dresses, dress/casual pants and shirts were more likely to be marked down. In addition, you could see some retailers' growing worries about whether their outerwear inventories were too large at this point in the season, with higher discounts across many outerwear subcategories. By now your inbox has exploded with emails touting special sales and discount codes, so in the name of research (and finding ourselves a few good deals), we audited thousands of emails covering the gamut from department stores to pure play e-commerce sites, in order to understand what the prevailing strategies were. For the most part, there was fine print applicable to these site-wide discount codes, where we’ve seen an increasing number of brands being added to the excluded list. We're talking about you, department stores! In addition, department stores frequently had category-specific discount codes. In examining the strategies of both large- and small-scale players, we noticed two interesting trends in emerging brands' approaches to holiday weekend discounting. The first was that many of these disrupters offered lesser (20% or less), shorter-run discounts. The second was that discount codes were coupled with the condition that items were final sale, a smart move for retailers defending themselves against the high cost of processing returns and the risk of holding onto deadweight inventory. It may be a risky approach, but it has, in many instances, successfully trained consumers that brand discount codes are infrequent and inventories scarce. With the majority of consumers citing that their holiday shopping is only just beginning, there's much more to unfold as the season progresses. Stay tuned, as later this week will we examine more closely what happened during Cyber Monday and global trends in discounting.